So, let’s see. We arm Afghan rebels to fight the Soviets. The Afghans drive the Russians out of their country. We ignore the Afghans. They stew for a few years and hook up with Osama bin Laden. . . .
Crile, a producer for 60 Minutes, doesn’t follow this logical train to the roundhouse, but neither does he portray Texas congressman Charlie Wilson, the man who put rocket launchers into the hands of the future Talibanistas, as a hero (or villain) unalloyed. Indeed, he writes, quoting a CBS cameraman, that “you could turn Charlie Wilson into the biggest hero you’ve ever heard of . . . or the biggest clown.” There’s buffoonery aplenty in Crile’s portrayal of Wilson, a cowboy-boot-clad gent who liked to squire around beauty-contest winners and drop wads of cash on the gaming tables of Las Vegas. But Wilson found his life-or-death, utterly serious cause in the Afghan resistance to the Soviet invasion of 1979, which gave him the opportunity to stick it to the hated Russians and build a power base for himself on Capitol Hill. Not that he had to fight terribly hard to enlist support in Congress: when Wilson first raised the prospect of giving a mere $40 million to the Mujahideen rebels, “$17 million of that specifically earmarked for getting them a better anti-aircraft gun than they presently have,” he was amazed to find that no one objected. 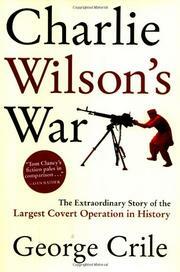 Working with a shadowy Greek CIA operative and a handful of true believers in the anti-Soviet cause (one of whom, Cline writes, had trained to parachute into Russia with a “small tactical weapon strapped to his leg”), Wilson got those weapons into Afghanistan—and after them, plenty more, and all without the publicity or controversy that attended other arms deals of the Reagan era. An engaging, well-written, newsworthy study of practical politics and its sometimes unlikely players, and one with plenty of implications.